Central Alberta is a glorious place to be in the summertime. The blue sky above seems never ending, as do the blooming yellow canola fields all along the side of the highway. Communities all over the province come together to celebrate the bounty of the land, enjoying the fruits of their labour and looking forward to harvest time. 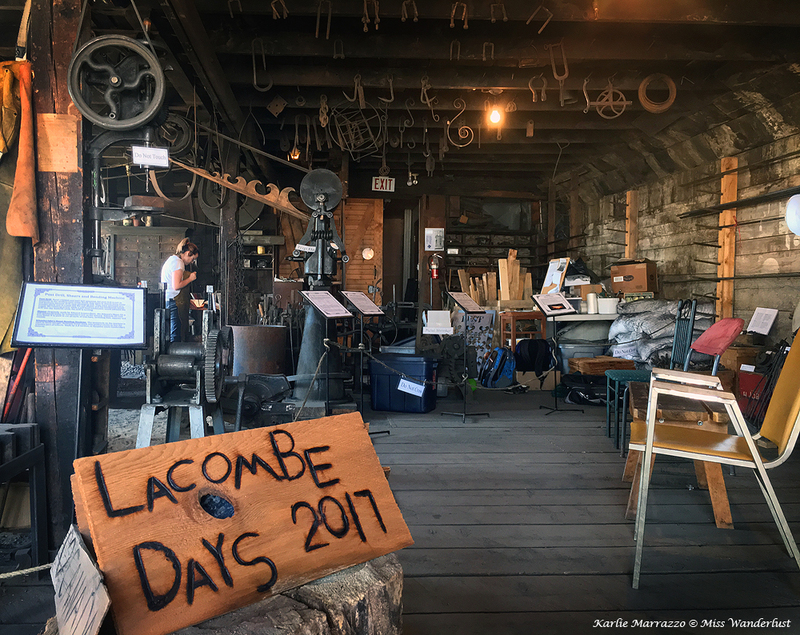 Each year in July, a major celebration takes place in the small city of Lacombe, simply called Lacombe Days. 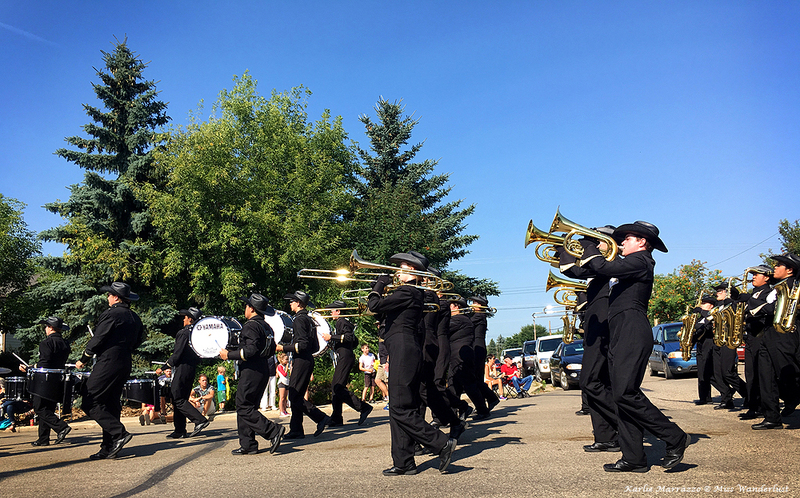 Nobody quite knows when the first Lacombe Days was held, but it has been running for over 20 years and is a highlight of the summer festival calendar in Alberta. As a born and raised Alberta girl, one of my simplest pleasures is to hop in my car, throw on some tunes and hit the open highway in my home province. I had never been to Lacombe before, so Lacombe Days was the perfect reason to discover somewhere new. The annual festival runs over four days from a Thursday to Sunday, each day packed with fun events for everyone. I made it down to Lacombe on perfect Saturday to check it out for myself. First up on my agenda, and one of the highlights of the weekend, is the Lacombe Days Parade at 9:30am. People of all ages lined the parade route, which runs over several blocks throughout the charming downtown area. Being a city girl, I couldn’t help but notice the real sense of community as I observed the crowd. Generations of families sat together, grandmothers holding brand new babies while young kids leapt with excitement at the candy thrown from the floats. Not only did the parade feature the Mayor, local business and dance demonstrations, it also showcased Mayors and Reeves from other small towns in the area, war veterans and impressive military machines, the incredible Stetson Marching Band from Calgary and local Shriners making zany moves in their tiny cars. I was touched when a polite girl of about eight years old noticed me sitting on the curb and offered me her camping chair to sit in, as she was too excited by the parade to sit in it. Next up on my self made tour of Lacombe was a stop at the fire hall, which was having a BBQ and an open house. I got way more than I bargained for thanks to Lt. Zach Walker, a volunteer firefighter who has been with the department for five years. Lt. Walker began our tour with a look at the pride of the department, the family of fire trucks and their life saving equipment. We moved inside the fire hall to get a behind the scenes look at life at a fire hall. He described the unique brotherhood that firefighters everywhere are a part of, showing us a wall of proudly displayed badges from fire departments around the globe, from New York City to Hawaii to Tehran. He must have read my mind, because before I even got a chance, he asked me if I wanted to take a spin on the fire pole. I first wrapped my arms and then my legs around the pole, sliding down to the main floor where all of the firefighters’ equipment hangs, ready to go as soon as they need it. 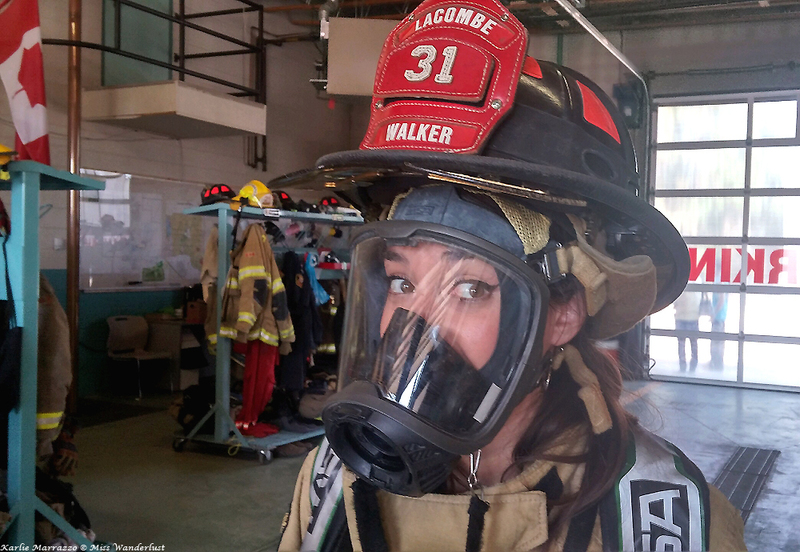 I then came the closest I will likely ever get to being a firefighter – I got to try on the full uniform. I stepped into the pants and boots, standing and ready to go. I pulled up the suspenders, put on the jacket and secured the helmet and oxygen mask to my head. Eighty pounds of gear weighed down my small frame. Breathing through the oxygen tank while trying to lift my feet in normal steps made it feel like I was walking on the moon. As Lt. Walker explained to me that this process has to take place in two minutes or less when they get the call, I felt an immense appreciation for all of the men and women who perform this duty under such intense physical and mental duress. 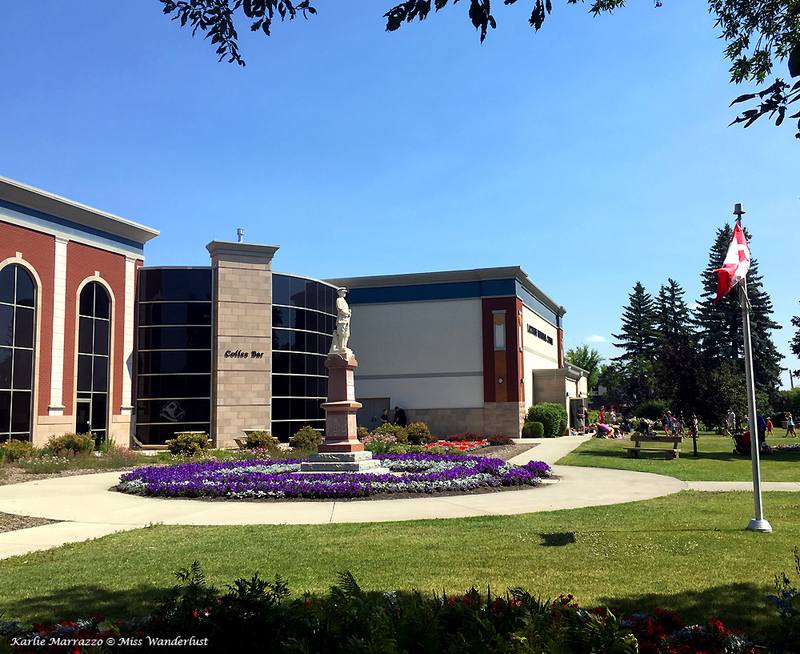 Next door to the fire hall is the Lacombe Memorial Centre, a multipurpose facility that hosts several events during Lacombe Days, including a book sale, Rose and Lily flower show, a community market, penny carnival and tons more. 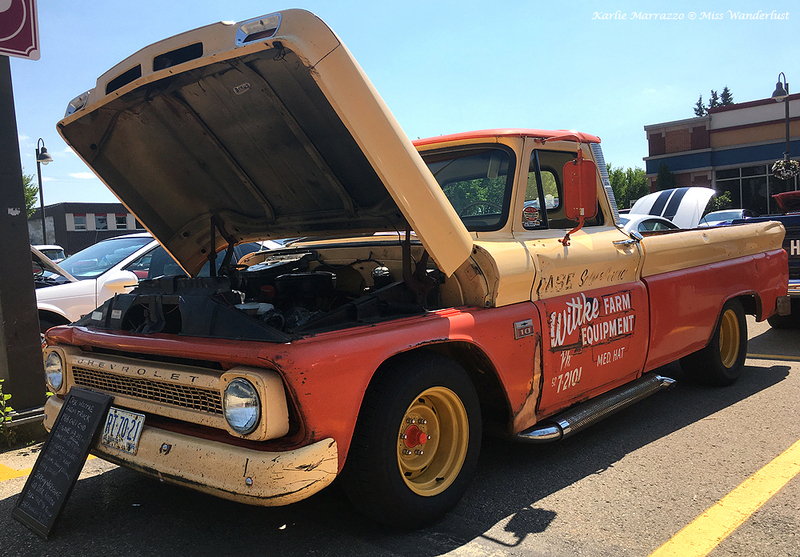 In the parking lot, a Show & Shine featured hot cars glistening in the midday sun while a rock band played nothing but the classics. 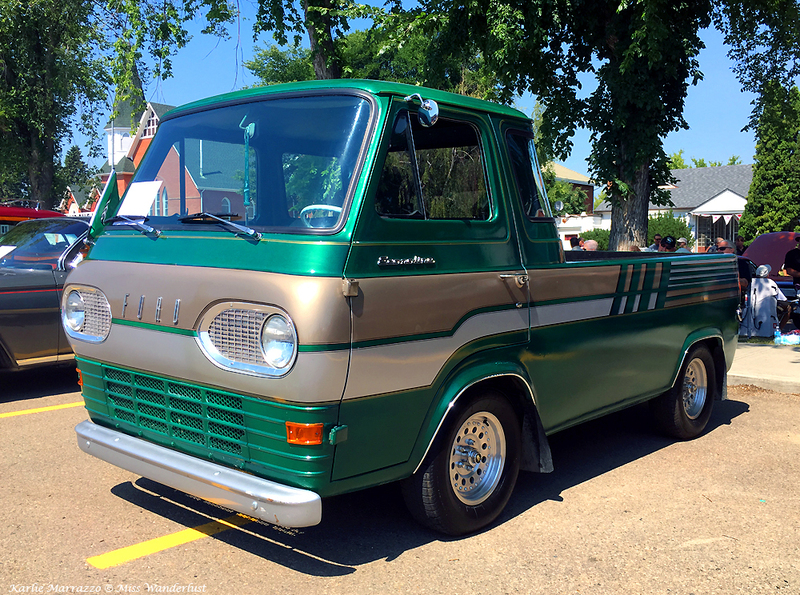 Some of my favourite cars were an original Mini Cooper in British Racing Green, an old Chevy farming truck, and a Lacombe No. 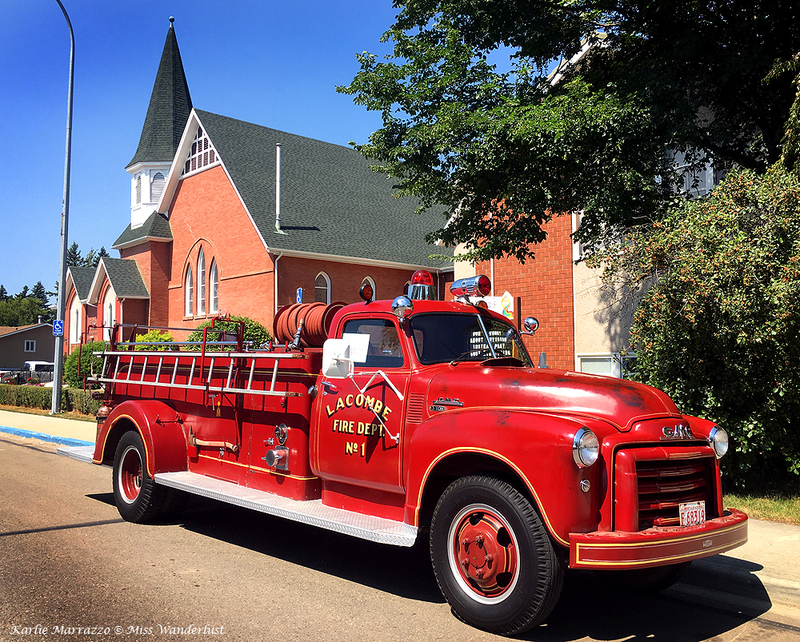 One fire truck that looked to be from the 1940s. We sauntered a couple of blocks over to the historical centre of town. 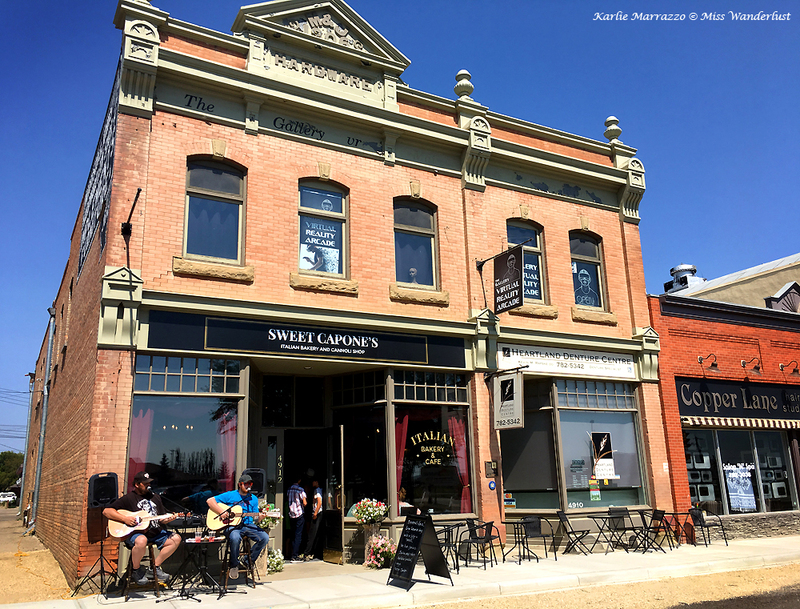 Recognized as Canada’s Great Street by the Canadian Institute of Planners in 2013, Lacombe’s historic Main Street is a beautifully preserved throwback to life at the turn of the 20th century in rural Alberta, boasting the most intact concentration of Edwardian buildings in Alberta. The architectural jewel of town is the Flatiron Building. 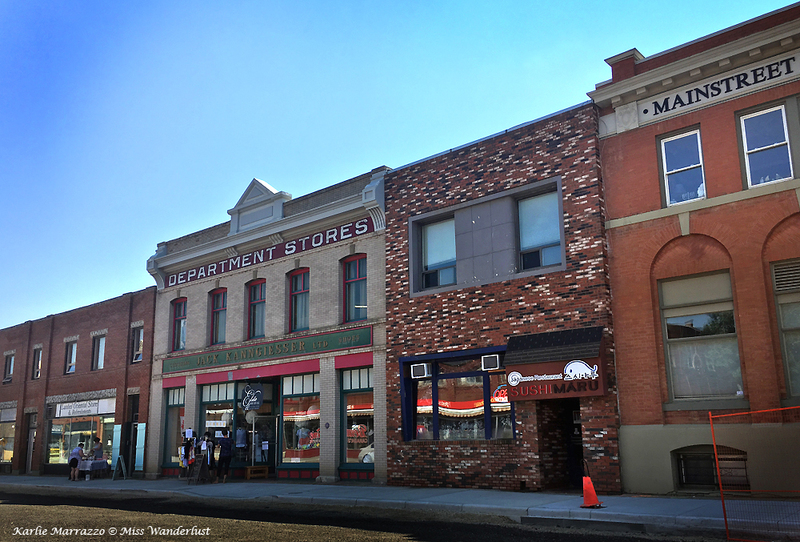 Built in 1904 to house the Merchants Bank of Canada, it was bought over 100 years later and turned into the Flatiron Museum and Interpretive Centre, showcasing the history of the town of Lacombe. Across the street, two buskers strummed guitars outside of Sweet Capone’s, the town’s renowned Italian bakery. Famous for their Italian cannoli in the heart of the prairies, my party of three scooped up six in all different flavours, and I couldn’t help but devour my tiramisu cannoli as we strolled down the street. One of the most important historical properties in Lacombe is the Michener House Museum. Built as a clergy house in 1894, the house later became famous as the birthplace of Rt. Hon. Roland Michener, the 20th Governor General of Canada. 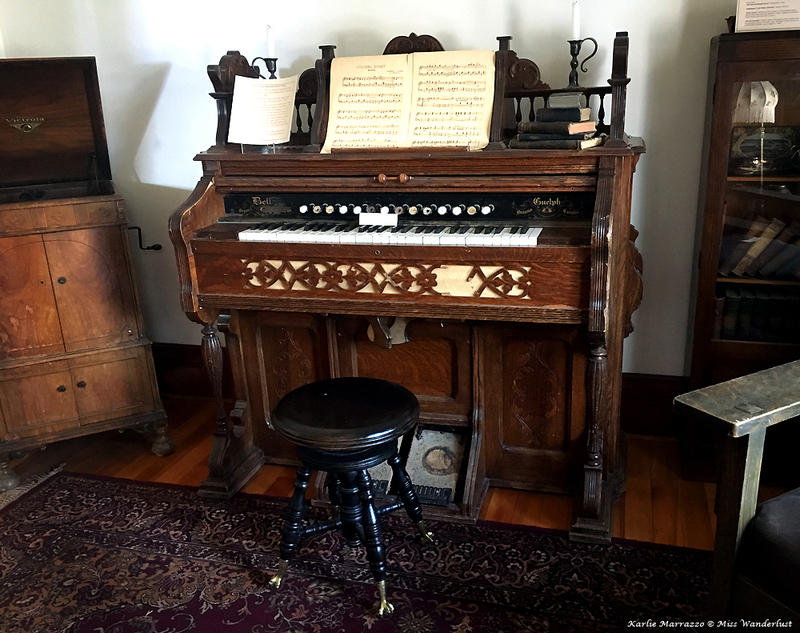 The perfectly preserved home showcases items from a turn-of-the-century home on the main floor, and upstairs features the room where Mr. Michener was born alongside mementos from his time in office. 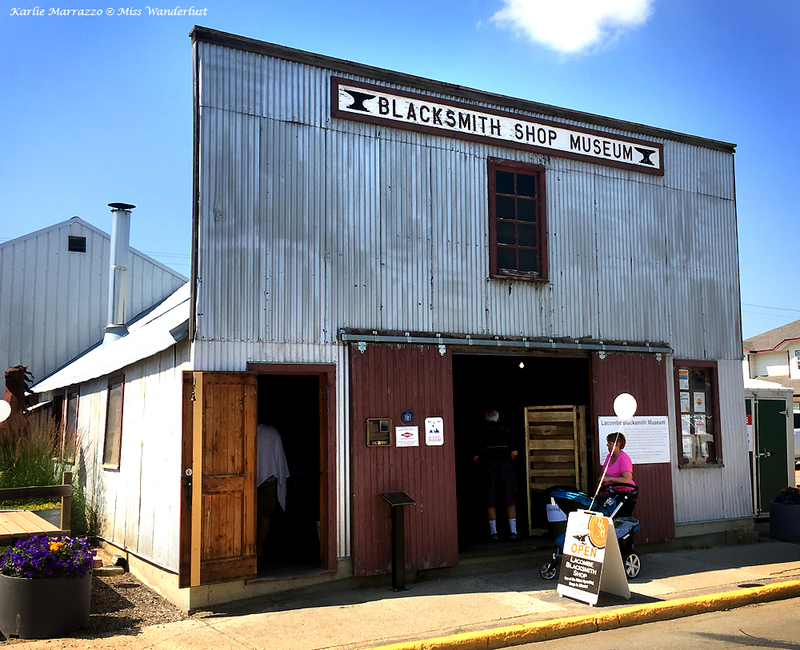 Lacombe can also boast about having the oldest functioning blacksmith shop in the province. Built in 1902, stepping into the tiny shop was like stepping back in time. The heat of the fires magnified the heat from outside and the only light came through the windows from outside. 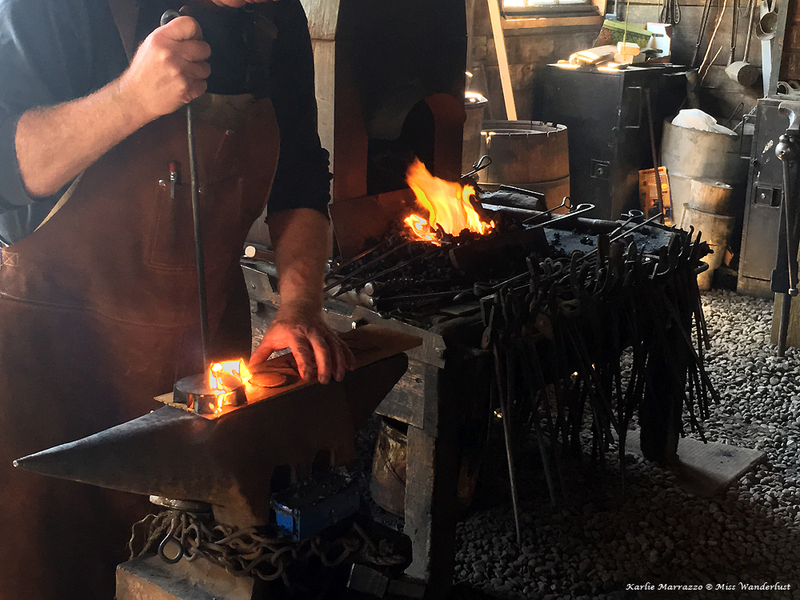 The smell of rich wood and smoke hit my nostrils as I watched the blacksmiths expertly practice their craft. 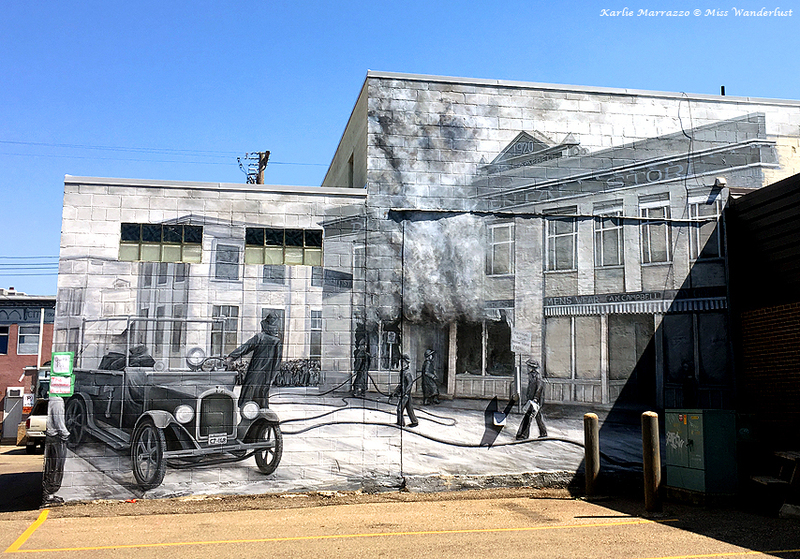 As I walked around the historic centre, I noticed several beautiful murals depicting life in the early days of Lacombe. 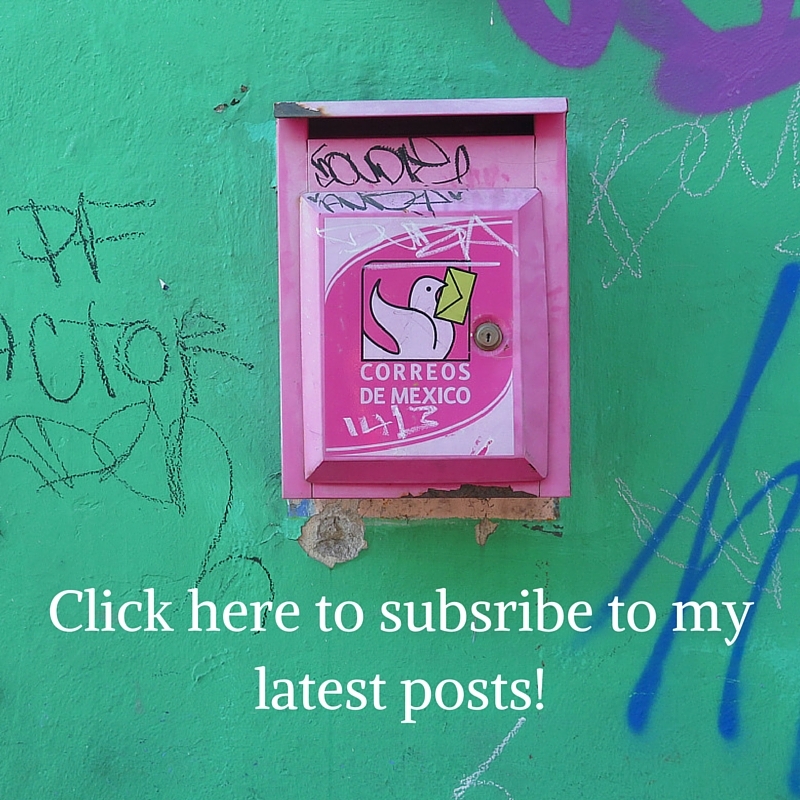 You can find directions for a self-guided mural walking tour here. I had such a full, fun day in Lacombe and my experience at Lacombe Days didn’t even scratch the surface of the events taking place. Lacombe is quickly becoming it’s own foodie hotspot, with a bevy of unique restaurants, as well as a local brewery, featuring on the local dining scene. Locavore Lacombe, part of Lacombe Days, features professional chefs crafting delicious meals from local produce for only $35. 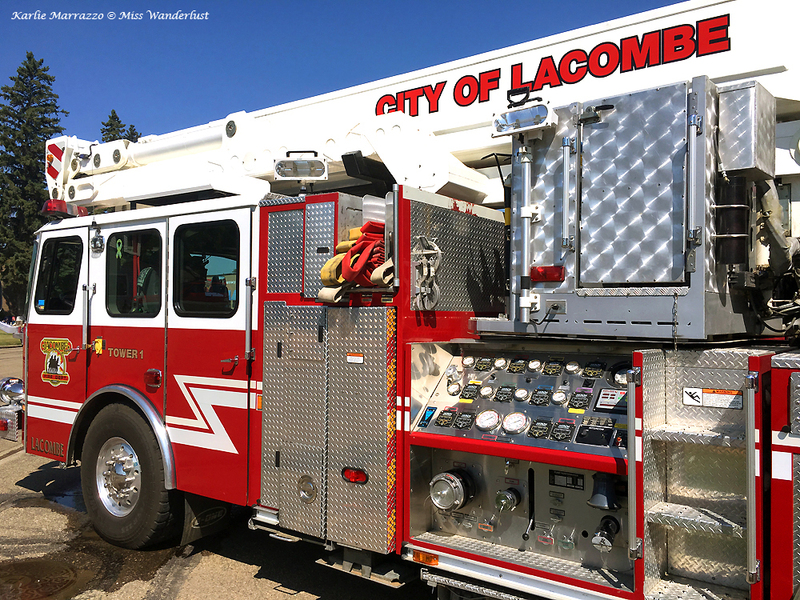 For a complete listing of all of Lacombe Days’ fabulous events, click here. I know I’ll be back next year to take in more of the activities. My biggest thanks to Lacombe Days Association for inviting me to enjoy the party! Although this is a sponsored post, all opinions are my own. If this isn’t the cutest little town ever!! I want to check it out! I love vintage cars- always great photo ops! Glad you enjoyed! What an amazing article! A must read!!!! I’m so glad I got to share this day with my best friend and her dad!!!! A fantastic experience and perfect day!!! It sounds like Alberta is a great place to have grown up, and a great place to visit. Great photos as well. Ill have to look into seeing it someday up close and personal. This sounds like a really fun event, I’d love to check it out. Love all the vintage vehicles and historic architecture. I love small towns like this! Thanks for sharing! I love all of those vintage cars. Seems like a neat place to visit! What a cute little town. I love jumping in my car and exploring. Will be adding this to my list as I already want to visit Alberta! This town looks so lovely! I’d like to visit it as well! I have yet to make it to Alberta, but Lancombe looks lovely! I always find local fairs and such to be a great way to explore a town. What an awesome festival! And the town looks like the cutest little place. I swear I thought it was something out of the Cars movies when I saw the vehicles! I studied abroad in Canada but I was located in the Ontario area. I have a good friend that lives in Alberta and hope to go soon. This post was the first time I’ve heard of Lacombe or this summer event. I would love to visit the museum and the tiny shops in the area! That looks like such a fun event! I love it when I can make it to local events. And you are too cute in the fireman’s mask! That’s so much fun! I love small town festivals. There’s always something interesting to do. Wish I had read this earlier- now I’ll have to go back! Great article. I didn’t know about this festival and yet I’ve shown this to hubby: we’d love to attend next time! It sounds fun and welcoming, exactly what we’re always looking for when traveling! Added it to our bucket list! So many things to see and do on Lacombe Days! It definitely seems like a great occasion to get to know more about the town’s culture and history. Love it! This looks like so much fun! I haven’t made it out to rural Alberta myself, but this makes me want to! Looking good in that fire fighter uniform and I love summer festivals that celebrate local areas. It was always a tradition in my family to go to local fairs. Also love the quaint feel of your pictures. Thanks for sharing. I love exploring my back yard so to speak. It’s amazing what treasures you find. Great article and photos. Never heard of this before, but it sounds really cool. Bookmarked, in case I get to travel there sometime in the future 🙂 Thanks!! This looks like such a great time! Alberta is on the top of my list of places to visit in Canada! What a charming little town! I love the sense of community at these local festivals, as evidenced by the little girl offering you her chair. You had me sold on this town with cannoli. And I’ve always wanted to go down a fire pole! THE CLASSIC CARS AND FIRE TRUCK REALLY MADE ME SWOON. THIS IS SUCH A FUN PLACE TO VISIT. I love this kind of exploring of small towns. You can be surprised by the most charming places you had no idea they existed! Wow looks fun. would surely want to visit here. 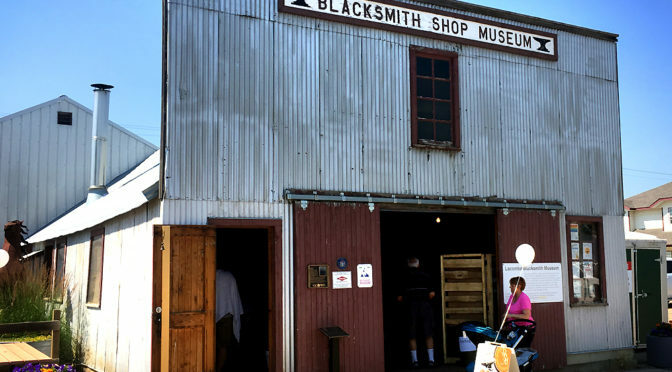 The part I am most excited about is the fire hall tour..
Also the blacksmiths works are something I am keen on seeing. This town reminds me of a classic movie, or pleasantville haha. So cute. I love going to town events. It gives me a new appreciation for my community, however, we don’t have a rose and lily show. I bet that was beautiful to see.